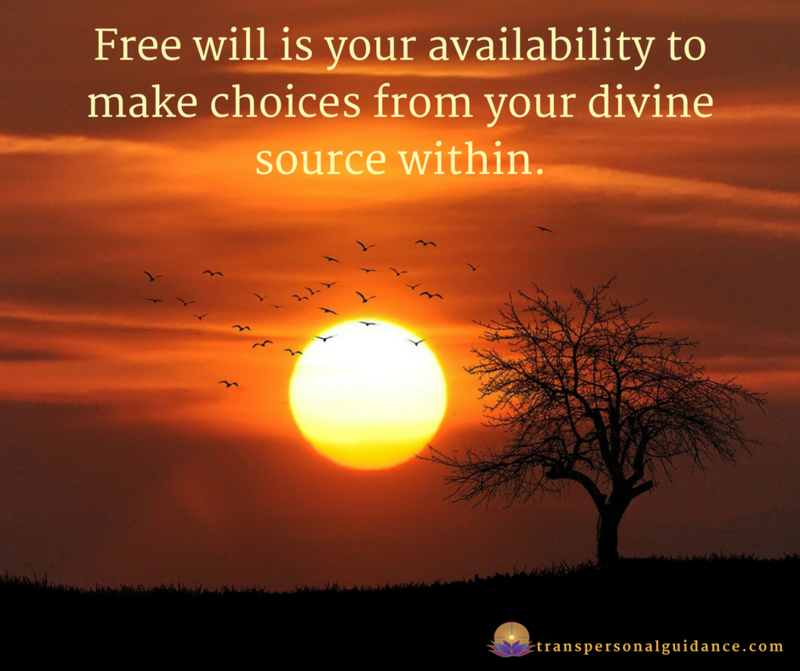 The Power of Free Will is Not What We Think It Is! To make sovereign choices, meaning our choices are coming from a place of conscious awareness, and from an independent limitless place within us, we need to first realize most of the choices we make in our lives come from an unconscious place. We continually make choices from a place of safety and comfortability. These safe and conformable choices are really connected to core defenses. Our defensive reactions occur out of a desire to protect our limiting beliefs, thoughts, and stories. If your defense is to get angry and fight for yourself when a challenging situation occurs, then you often make choices confirming your need to feel angry, fight for your limited beliefs, and even argue for past stories that no longer have any basis in reality in the present moment. If your defense is “feeling not enough,” then you will make choices convincing you how you’re not enough so you please others to try and fill the never ending hole inside. You make choices from mediocre standards related to having a certain kind of relationship with your partner, or eating certain kinds of foods, but then you overcompensate and continue to make unserving choices that try to “fill you up”. If your defense is going into withdrawal from a challenging situation then you will make continual choices to run away or go into a fantasy or leave your body. You might make choices to watch a lot of movies or read fantasy books (which I love by the way), or consume alcoholic beverages when in fact you know there are other more valuable ways to work with the challenge such as taking a bath for self-care or actually connecting with a mentor or body worker to help you come out of your defense, and back into your body. The point here is: Most of our choices are actually made out of defensive reactions we have accumulated since we were children, and we have carried with us from past lives on a soul level. When making choices from our defenses, our opportunities for spiritual potential is less available. Until one day, we become pushed by an outside incident causing us to awaken. Such as getting into an accident, or the death of a family member, or maybe we take psychedelics, or we have a profound spiritual experience. We begin to see how we thought our lives were comfortable when actually they were not comfortable at all. We begin questioning our relationships and friendships. We begin questioning our jobs and whether we really want to go to work where we are being bullied by our boss or where our assistant is a very fragile volatile person. We may even begin to notice how we become angry about the choices we have made which can lead to judgement. We actually begin to see how we have been living from mediocre standards, and have been making choices from a place of feeling undervalued and unappreciated. When we make unconsciousness choices, we are making choices out of Fear. I talk a lot about fear because it's one of the main driving point of our lives; for making choices, and to do something or not to do something. Having the courage to change your fear into excitement brings you to the edge of where you are, and helps you take the leap toward more of what you desire. Fear is a bit of a double edged sword because it wants to protect us and keep us safe from whatever happened decades ago, and yet it also overcompensates by desiring to keep us comfortable which triggers great amounts of judgment and doubt. Fear is energy. It is a vibration. When we can really FEEL the Fear for what it is, a vibration in the body, then it can move through, and no longer has such a tight grip on our lives. Then we begin to have more freedom of choice. More access to the yummy loving energy in our lives. All along as we’ve been making unconscious choices, we’ve been being spurred on by our soul. We've been receiving intuitive visions and guidance, and we’ve been led, whether we realized it or not. We've been led by our soul which has been led by Divine Source. Often our past selves carry a heavier energy, and are in a lower vibration than our future selves, depending upon our past situations, of course. Fear is carried with us from the past. Even if we’ve had some amazing joyful experiences in the past, often our minds latch onto the negative, and store fear as a contracted state in the body. To begin to shift the vibration of fear, we need to give our attention to positive experiences along with allowing the fear to be present simultaneously. Because all of this is happening simultaneously — the past self, present self, and future self. That’s why spiritual teachers talk about being in the present. The goal here is not to get caught up in the future self - the desired self, and not to get caught up in the past self and the unconscious defensive behaviors. We need to see both for what they are: thoughts, beliefs, stories, and energy. Which allows us to begin to make choices from a neutral place of soul connection as well as non-attachment to the outcome. Making Choices is Not the Same as Accessing Free Will. Most everyone on earth, a very large percentage of people, about 97% of people, have very little access to free will. Thich Nat Hahn talks about free will as a tiny little spark of energy we have the opportunity to connect with to make limitless choices. However, very few people know about this tiny spark, and even fewer are able to connect with the spark because of the stored consciousness within the body. Stored Consciousness is all of the energy from past lives, including the unconsciousness defensive energy I referred to earlier. All of this energy is stored behind the navel, in the lower Tan Tien region in the belly which is a tight sphere behind and below the navel in the belt meridian. The paradox of the Tan Tien is this is the very place of our Stored Consciousness, and it also is where our Intent to access Free Will resides. We must be able to access the power of our Intent amongst the fear of our defenses! This is why we see super heroes wearing large belts across their navels. These belts are a symbolic representation of the super hero’s potent power of intent! Therefore, in order to access choice as free will we have to really be awakened. And, we need to move beyond being awakened toward fine tuning our perspectives, fine tuning our awarenesses, and fine tuning our intents to actually be able to make a choice not connected directly to our destinies as the future, and not directly connected to the past and our defenses, but is right here in the present. The choice arises right here, and right now from our soul’s intent. There are very, very, few people that are actually making choices from this place. Even so, let’s not become discouraged! Because it is very possible to cultivate our awareness, and connect with the actual energetic point of intent to access free will! How do we create sovereign choice making when we know most of our choices are coming from a place of unconsciousness? We make sovereign choices by building awareness, and connecting with intent. Intent is related to having an intention, and at the same time Intent is its own energy. Intent is its own field. We need to be to have a strong inner authority, a strong inner core, to connect with the field of intent. It's also necessary to have greater awareness of our capacity to make choices. Choices not driven from the past and our defenses, and not driven from the future either, can be made here in the moment. In the present moment, we can make sovereign choices from the spark of awareness connected to the potency of intent. This may seem difficult. It may seem impossible. It may seem to be number of things, and yet free will is accessible! To begin to come to this level of choice making from intent, we need to cultivate our awareness of our choice making. We do have choices, and we can make them. We can focus on making each choice from a more neutral place, and less of an unconscious defensive place. Less from a reactive place, and more from a responsive place. By doing this over and over again, our awareness shifts, and our connection and access to soul intent increases. We have to know what our primary core defense is, and be able to shift out of the defense to have access to our intuitive guidance. To fully believe our intuition, and fully trust it. Then take action from there, no matter what we perceive the consequences are going to be. Then we are walking the edge in life. Walking out of the choices of comfortability, the choices of seemingly safety, and walking to the edge of possibility. That’s the difference between unconscious choice making to sovereign choice making. We are moving from a place of stuck (stored) consciousness, and into a place of limitless possibility and potentiality. Intent and intention are so magnetizing and manifesting because when our souls are aligned with our intent connected with the divine life force & intuitive guidance, then our choices are easily accessible and easily made. If you're ready to shift out of your core defense keeping you safe and protected with fear, to instead connect with the intent of your free will, contact me! I have strategies and specific guided journeys to work at this level. Let's get started on the next level of your high vibrational enlightenment journey! Want to receive my uplifting monthly newsletter - "Letters from a mystic" - full of insight, wonder, and Practical Intuition Practices? Sign up below!